This implementation guide forms part of HISO 10008: Pathology and Radiology Implementation Guide and Messaging standard. The guide provides assistance in the development of applications using structured messaging to specifically report notifications into the Electronic Notifiable Disease Messaging System (ENDMS). provision of technical information required for a health provider (or their system vendor) to make all the necessary system changes to support the ENDMS. Ministry of Health. 2019. 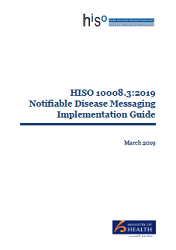 HISO 10008.3:2019 Notifiable Disease Messaging Implementation Guide. Wellington: Ministry of Health.